2/6/16 – 94 triangle units are made and block assembly will begin tomorrow. 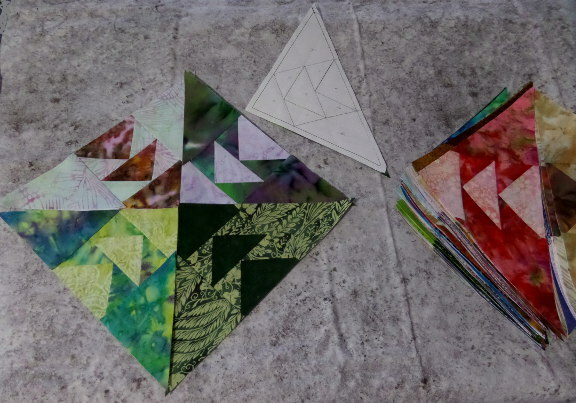 I have enough triangles to make a sofa-sized quilt. When these units are assembled, I’ll decide if I want to increase the top size by making more blocks or by adding borders. 1/18/16 – Have assembled 30 triangle units. The toughest challenge is deciding which fabrics to pair together. Enjoying the process and fondling my favorite fabric in the stash. 1/10/16 – Developed a foundation paper pattern, templates for cutting and began piecing ‘Wild Goose Chase’. 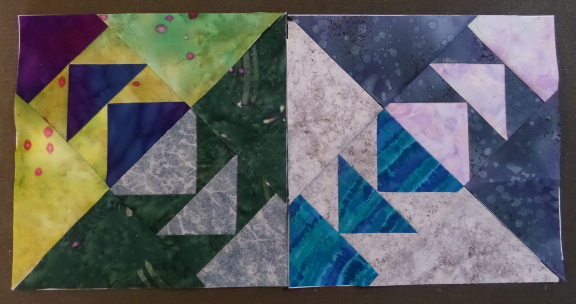 This photo shows 4 foundation paper pieced triangle units. Because I’m new at this technique, the progress is slow but I’m gaining speed with each unit I make. I like the technique and though this is a fairly simple pattern, I realize how using this technique can result in some very intricate designs. Fun! Copyright © http://www.shirlsu.com 2016 - 2019 all rights reserved.